This is what separates the Professionals from the Imposters in the Freight Transport Business! We MOVE Partial Truckloads EVERY DAY,RESULTS you CAN count on..AFTER HOURS at (352)410-0917..NO ONE BEATS OUR SERVICE,Last minute RUSH Shipment,NO worries we answer AFTER NORMAL BUSINESS HOURS, WE DO EVERY DAY,THAT IS WHY WE ARE THE BEST... We will listen to your needs,whether moving Tractor Implements to Hewitt,TX or Pumps in or out of Beaumont.TX, Wilmington,NC or Tampa,FL to name a few... and craft a plan that is cost effective,time sensitive and execute until we achieve your desired results.... Our PARTIAL Truckload specialists will manage the shipment variables you provide by a partial load move, executing a plan to save time,money and piece of mind like we do with HUNDREDS of other Customers daily.... Whether we'll be moving one partial load from Saranac Lakes,NY to Bakersfield,CA or trucking partial loads out of Decatur, Illinois to Linden,TN every week, partial load execution requires the experience, finesse and connections that we bring to the table. Partial Truckload Freight(sometimes confused as LTL) involves one of our trusted flatbed and step deck freight haulers or it calls for a long haul dry van, we get it done right. In the world of freight trucking, partial loads are shipped for the lowest cost with the least headaches when you have EXPERIENCE and RESOURCES working for you. The art of the partial load move is one of our areas of expertise. Getting the job done with partial load shipping requires proper planning with fully vetted hotshot and flatbed freight haulers. Whether you need partial shipping help one time or you plan on trucking partial loads out of Elgin,Illinois for the next 50 years, reduce your costs and increase you peace of mind by choosing Freight Pro Source. Have something to ship, but not a full truck? No worries, that is our specialty. In addition to our resources, experience and skills, part of our success comes from the hotshot and flatbed freight haulers we utilize when planning and executing partial truckload freight shipments. We plan, implement and execute programs for multiple freight customers in certain geographical areas such as the Southeast, Midwest, Texas region and the West coast to keep your expenses down and get your freight delivered on time. 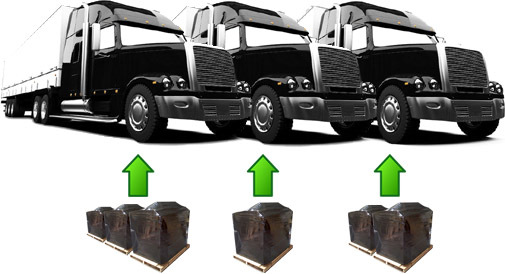 Partial truckload (PTL) freight shipping is a specialty niche of our freight shipping services. Whether it involves equipment and machinery dealers, distributors, manufacturers or the farming and agricultural community at large, we provide partial truckload arrangements every day to save you time and money in the process. As project and business managers, we leave no stone unturned to bring you the best results. Many times, we work many tireless hours behind the scenes to provide you with the solutions that you expect and deserve from us. For after hours service, please call (352)410-0917 and WE WILL HELP YOU! Call (352)650-0678 with any questions regarding Partial Truckload Moves Today!